Coins? Or Stamps? What if you find something which combines both of your hobbies? Numismatic Stamp is a fun way of sticking to your hobbies. Many countries in the world have issued stamps featuring legendary coins of the country. 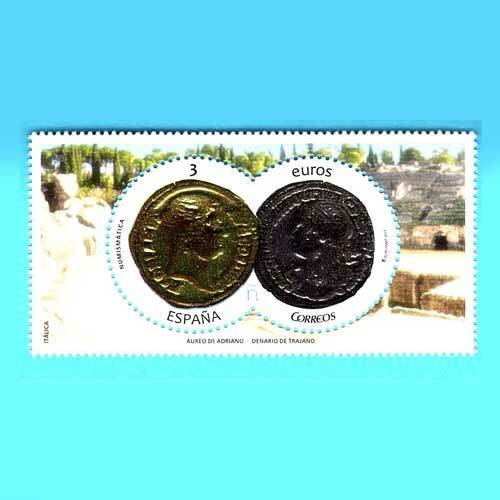 Spain, for example, has also come with a stamp depicting two of the ancient coins. This three euro stamp depicts the Golden Aureus of Hadrian and the Silver Denarius of Trajan to commemorate the 1900th anniversary of the death of Trajan and succession by Emperor Hadrian. Trajan is considered the most important Emperor of the Roman Empire. His death occurred when returning from a campaign in Mesopotamia. He was succeeded by Adriano, also born in Hispania but educated in Rome by Trajan, whom he accompanied in numerous military campaigns. Correos Spain has honoured both the emperors in one stamp featuring their coins. The stamp shows Amphitheater of the Roman city of Italica in the background.